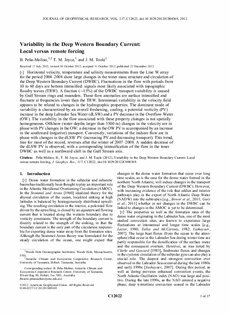 Horizontal velocity, temperature and salinity measurements from the Line W array for the period 2004�08 show large changes in the water mass structure and circulation of the Deep Western Boundary Current (DWBC). Fluctuations in the flow with periods from 10 to 60 days are bottom intensified: signals most likely associated with topographic Rossby waves (TRW). A fraction (∼15%) of the DWBC transport variability is caused by Gulf Stream rings and meanders. These flow anomalies are surface intensified and fluctuate at frequencies lower than the TRW. Interannual variability in the velocity field appears to be related to changes in the hydrographic properties. The dominant mode of variability is characterized by an overall freshening, cooling, a potential vorticity (PV) increase in the deep Labrador Sea Water (dLSW) and a PV decrease in the Overflow Water (OW). The variability in the flow associated with these property changes is not spatially homogeneous. Offshore (water depths larger than 3500 m) changes in the velocity are in phase with PV changes in the OW: a decrease in the OW PV is accompanied by an increase in the southward (negative) transport. Conversely, variations of the inshore flow are in phase with changes in the dLSW PV (increasing PV and decreasing transport). This trend, true for most of the record, reverses after the winter of 2007�08. A sudden decrease of the dLSW PV is observed, with a corresponding intensification of the flow in the inner DWBC as well as a northward shift in the Gulf Stream axis.